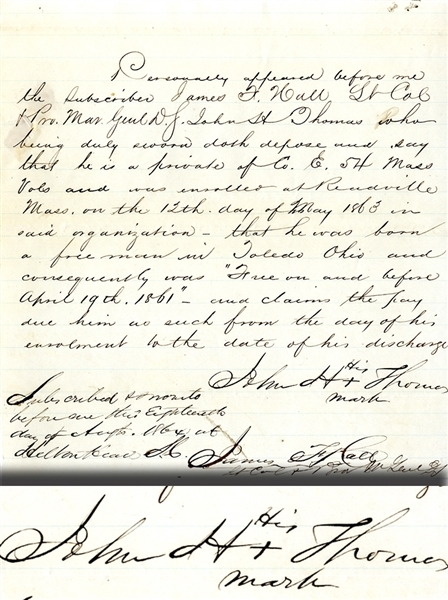 War-date Manuscript Letter Signed with an “X” by John H. Thomas, Co. E, 54th Massachusetts Infantry, 1pp. quarto, August 18, 1864, and attested as witness by James Frederick Hall (1823-1884) and reads in part: “...Personally appeared before me the subscriber James F. Hall Lt. Col. & Pro. Mar. Genl. D.S. John H. Thomas who being duly sworn doth depose and say that he is a private of Co. E 54 Mass Vols and was enrolled at Readville Mass on the 12th day of May 1863 in said organization, that he was born a free man in Toledo Ohio and consequently was ‘Free on and before April 19th, 1861’ and laims the pay due him as such form the day of his enrollment to the date of his discharge. Fine condition.